Within the last few months, we've seen wellness runs, fitness runs and fun run events left and right. Thousands of people have joined and the experience is thrilling when you run together with that many people. It's great that these events are spreading health awareness to the public and making it a fun and exciting event altogether. The wellness runs were designed for the capacity of the general public, hence the 3k and 5k runs as the basic categories and the 10k and 21k catered to more advanced runners with the strength and stamina to endure a longer course. Despite the 10k and 21k being the longer courses, thousands of people join them and finish. Like what the wellness runs day, it doesn't matter how long you take as long as you finish. It's not a question for the more experienced runners whether the'll finish or not. It's more a matter of breaking their personal records. So what could possibly challenge their capabilities and push them to the limits ? How about making the run longer ? How about making the path more challenging ? How about making it hard to breathe ? If you think you'd like to see how you would fare in these extreme conditions, then join The North Face 100. The North Face 100 (TNF100) will be held in Baguio-Benguet from April 24 to 25, 2010. This isn't for the faint of heart (nor the breathless) as there aren't any 3k, 5k nor 10k courses. The shortest course is 11k followed by 22k, double the distance. For the elite runners, a 50k and whopping 100k course is going to challenge even the best of runners. In addition to this marathon's great distance, the elevation, climate and trail will all pose additional challenges to the runners. TNF100, on its 3rd year, brings Asia's 1st Trail Running Ultra Marathon series to Baguio-Benguet. TNF100 continues to test the endurance of elite athletes and challenge aspiring individuals to define their personal limits in the gnarly paths, knife ridges, and treacherous mountain trails amidst the cool breeze and pine scent of the Philippines' summer capital. Experienced trail runners, mountain climbers, outdoor enthusiasts and those craving for the active lifestyle will find everything they wish for and more as TNF100 traverses unexplored trails of Camp John Hay, the Philippine Military Academy grounds, Mt.Sto.Tomas, Tuba and finish in Baguio's popular landmark at Burnham Park. You may welcome the scenery and cool breeze as motivation but the trails, elevation and distance will challenge your endurance, stamina and determination to finish this extreme run. If you can run like hell, the cold weather's there to cool you down. If you can run up and down, then the mountainous Baguio is up (and down) your alley. And if you run amok, well you'll need to catch up with the pack or else no one will know you're on a running rampage. Define your personal limits 6,000++ ft above sea level! 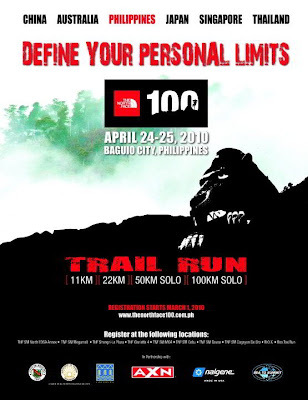 Join TNF100 in Baguio-Benguet. Visit: www.thenorthface100.ph. Interested individuals can register at The North Face branches at Shangrila Mall, SM Megamall, SM North EDSA, Glorietta 4, SM Cebu, SM Mall of Asia, SM Davao, SM Cagayan de Oro and at the Recreational Outdoor Exchange at Bonifacio High Street.